As Public Information Officer for the Columbus Fire Department in Columbus Indiana, my job is to let the local radio stations and newspaper know what the Department has done on fires, EMS runs, and HAZMAT runs. Other obligations, such as giving talks at local schools and community organizations and scheduling our Fire Safety House are thrown into the bargain as well. Our Fire Safety House is a fantastic tool that we use to educate first and second grade children on how to deal with a fire in their home. Stop, drop and roll, crawl low under smoke, stay away from matches and lighters, candle safety, and escape plans are just some of the information the kids get from the program. I thought I could do more, maybe for younger kids of preschool age. That’s what started me thinking about what kids would have fun doing and help them learn some valuable tips to boot. So I jumped on the Internet to see what I could find and I came across “The Little Fire Truck Company” It is located in northern California, and is a tiller truck that was built for parades. 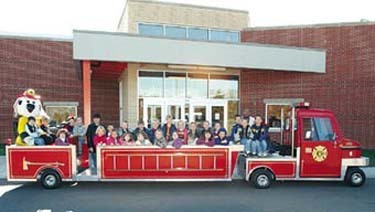 It looked like a great idea; after all, what preschooler wouldn’t love to ride on a “real” fire truck. So I went to Gary Henderson, the Chief of the Department, and ask if I could attempt to build something like that. Of course his answer was - quote - “go for it”. I knew the key would be to find some type of vehicle to use to pull a trailer that the kids could ride on. I nosed around and got a few tips on where I might locate an old Cushman Utility Vehicle. After a couple of disappointments I struck pay dirt at Columbus Regional Hospital. They had an old Cushman Truckster that needed some work but ran great…. Perfect. That’s where “I” stopped building “Tilly” and “We” started building Tilly. I found out that I had no clue how to get this job done. I called on Mark Williams, our assistant mechanic, and asked for the much-needed help rebuilding the Cushman Truckster. The shocks and springs were just lying under the front end and were rusted completely out. Brakes were, let’s say, less an adequate, and we had to remove the dump bed and fabricate some sort of bed that would accommodate a fifth wheel hitch that was donated by a fellow firefighter and his wife. The little truck was looking like it might work. Curt Carlson, the mechanic for the City Police, gave me an old light bar and Mark and I cut 9 inches off each end and put it back together so it would fit the Cushman’s 30 inch cab width. Now we needed the trailer for the kids to ride in…hmmm….well if in doubt call Dad. My father, Robert, is a retired Draftsman, Mold maker, Business Owner, and heck, he knows everything, so who better to ask for help? I explained to Dad what I was up to and he couldn’t wait to get started. We went to the maintenance garage where I would be spending a lot of time for the next 4 months. We measured the Cushman top to bottom, back to front. Then we measured a full size ladder truck (did I mention Dad was a stickler for detail). In no time Dad had a complete set of drawings for the trailer. Now I needed to find yet another Cushman to rob the front end out of so we could steer from the back as well. That came from some fine folks at Hawthorn’s Golf and Country Club. With design in hand, I went to Ivy Tech welding teacher Bill Kahrs and he accepted it as a class project for his welding class. Metal donated by Kroot Corp. was delivered to the school and things were coming together. Mark and I took the Cushman to Classic Auto Body and Jimmy Bennett gave it a great red paint job to match the painted aluminum that we planed to use for the skin. David’s Fabricating donated their time and equipment to cut out the skin and bend diamond plate for the bumper and trim. Ivy Tech called and said the trailer was ready to go and we started welding in the rear steering. Then we took the whole rig to Dad’s garage to put treated plywood on the floor and sides. Test drives proved that the Cushman’s 22 hp OMC engine would be plenty strong, but it wasn’t until later that we found out that it would pull the rig even in high range and in third gear. Top speed is only about 25 mph, so we needed a second trailer to haul Tilly and her little trailer on, and it had to have at least a 27 foot bed. A local company was taking out some old house trailers after purchasing some land, and I stopped and ask if they could save me a frame. They had one the next morning that was 28 feet long and 55 inches between the wheels. That left us 2-1/2 inches on each side to get Tilly on board. That is a little close, but hey, it was donated and it will work. Tilly is not as large as the fire truck in California, but Dad had found room for 9 feet of bench seats on each side for the kids to ride. I started looking for oak. It is hard to find someone to donate 15 oak 1x4’s, but Southern Indiana Mill Works stepped in and gave us all the oak we needed, and Dad and I sanded, stained, routed, and sealed, and installed it. Now it was time to bend some more skin and diamond plate for the back half of the truck. Oh-oh - David’s is swamped with work - time to regroup. Scott Maley is a firefighter on the department and works his days off at DLI, a heating, air, and ding ding ding metal working company. We gave Dan Ledwinka, the owner, a call and he let me use the equipment at his shop. With Scott’s help the trimmings were ready in a couple of days. It took Dad and I two weeks to get the skin, diamond plate, and electrical installed. The project was shaping up nicely now, and it was time to install the fancy things. ASC graphics told me early on that they wanted to donate the striping and lettering. Wow, what a difference the graphics made! It really looked like a fire truck now. All we needed was a couple of axes and ladders and the outside would be done. Two polished brass axe heads were given by one of Mark’s buddies. They were polished on one side, so Dad and I were going to put one with the head forward and one with the head backward. Next day I found that Dad had polished the backside of one of the heads to a mirror finish (did I mention Dad was a stickler for detail) so both axes could face the same way. Dan Lanham, our Deputy Chief, gave me an old telephone company ladder with wood rails and aluminum rungs, but the wood was in terrible shape from lying on the ground for years, plus it wasn’t really the size to meet the scale we needed. Well, that wouldn’t do so back to the mill to ask for some wood. They were gracious enough to donate four Poplar 2x4’s, so we sanded, stained, routed, and sealed the rungs for what would be our new rails. We used a saws-all to cut the rungs down to size and built and installed the ladders. Now the project was close to finished. We still need some tunes for the kids to listen to. I went to where my Son was working and ripped out his c.d. player. I installed it in Tilly’s cab, then went to Wal-Mart and bought a set of outdoor speakers for a boat and put them behind the cab so the kids could hear M.C. Axe and the fire crew sing songs about fire safety while they ride. We still needed to find someone to put a headliner in and the door covers on, but otherwise it was ready to go. Dad and I loaded it on our trailer, took it back to the maintenance garage, took the booms off, and -BANG- the trailer bent in the middle, all the way to the ground in the rear. Now what are we going to do! Mark is on the job and he said all we needed to do was cut the fenders off, cut the axles out from under it and add ¼ thick 2x4 square tubing to the rails with 3 inch channel iron supports between them. I couldn’t even think of what all this was going to entail, but in no time he had it road ready. This was a 6-month project and I owe so many people thanks, not to mention all the rides I promised to those that donated. In all it has been a great experience for me to spend some extra time with Dad working side by side. I was pleasantly surprised at how all the people in the community stepped up at the mention of the project. It is positive proof for all to see that everyone will do what they can to keep our most valuable resource, our children, safe. I hope Tilly will be a tool we use for years to come in order to teach our children the importance of fire safety.